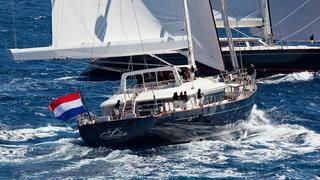 Designed by Robert Clark, Fleurtje was built in 1960 at the renowned Dutch shipyard of De Vries Lentsch. She was previously known as Carita and then Argonaftis. 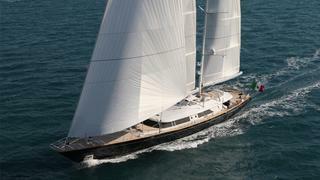 At 57 metres this sailing yacht has extremely elegant lines. The long overhangs at bow and stern, the rich Awlgrip blue hull and three Douglas Fir masts with stay sail plan, combine into a handsome profile. Since her launch, Fleurtje has undergone four refits and been maintained to Lloyds class standards. Such is the degree of ongoing improvements that she is now, certainly, one of the finest three-masted schooners afloat, accommodating 12 guests in six staterooms. Atmosphere is the third yacht in Perini Navi’s 53 metre series and currently 43rd in the list of the largest sailing yachts in the world. Designed to maximise the use of internal space, she offers exceptionally voluminous accommodation for up to 12 guests. Her enormous ketch rig delivers some 15.5 knots in ideal sailing conditions, a performance also provided by her twin 1,257 horsepower Deutz diesels. Her interior is familiar and warm, with comfortable furniture, russet-tined fabrics and elegant cherrywood joinery. Her lower deck features a sauna and separate Turkish bath. Launched in 1998, Jasali II (ex-Independence) is testament to the exterior and interior design skills and expertise of the team at Perini Navi. Refitted during 2008, this sailing superyacht offers accommodation for up to 12 guests in six suites and is capable of carrying up to 12 crew. She has always been superbly maintained under management that has included regular equipment servicing, replacing any questionable systems, and upgrading to newer technology as and when it has become available. Built by Alloy Yachts in 2002 and designed by Dubois Naval Architects, the 53 metre Drumbeat easily met her owner’s requirement to combine good sailing performance with comfort, sea worthiness and space. A unique design feature of the large sailing yacht is the layout on one level from cockpit through the saloon and dining area to the forward wheelhouse. This creates an expansive area for entertaining. In 2005 the interior was redesigned to reflect the simplicity and beauty of the lines of this stunning sailing yacht. The colours, materials and furniture are designed for comfort. Lighting has been brought to the highest standard, giving the option of setting the appropriate mood to the saloon and throughout the yacht. The overall feeling is one of casual elegance for 10 guests in five staterooms. 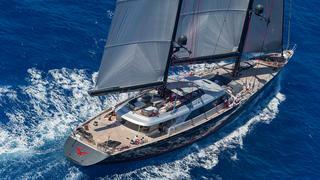 Nirvana takes advantage of a large fly bridge sailing yacht experience but has an added, particularly interesting feature: a total draft of no more than three metres. This has been achieved by developing a full-bodied hull form with generous beam, high ballast ratio and a pivoting centreboard to take the draft to 10 metres when fully deployed. This high aspect ratio foil gives efficient upwind performance, while the combination of generous beam and high ballast ratio gives excellent stability. As the name would suggest, Pink Gin VI is the sixth such yacht to bear this name, which is derived from a rhubarb-based cocktail. Owner Hans Georg Näder has also owned build yard Baltic Yachts since 2013 and his latest yacht is the largest carbon-fibre sloop in the world. Key features include a pair of fold-out balconies and two collapsible chandeliers that add a touch of glamour to the cockpit. With a jet-black hull and white superstructure, Parsifal III’s stylish design exudes excellence while also maintaining high levels of comfort and practicality. Her striking Rémi Tessier interior is highlighted by her blend of dark ebony woodwork, light sycamore, stainless steel and fine leather. Exquisite design and workmanship create an ultra modern and stylish feel for up to 14 guests and nine crew. 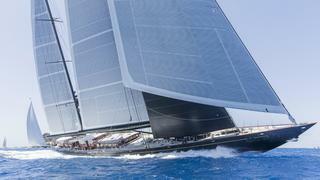 She's currently the 37th largest sailing superyacht in the world. Tiara is an impressive sight under sail. Designed by Dubois Naval Architects and built by Alloy Yachts in New Zealand, she is an example of magnificent craftsmanship combined with meticulous design. The big sailing yacht’s interior, designed by John Munford with a very positive input from the owner, is finished in flame mahogany wood with precision joinery typical of Alloy’s attention to detail. She is tastefully decorated with the finest fabrics and handcrafted furniture in an Art Deco style, designed and built by Patrick Gaguech of Nimrod, Paris. 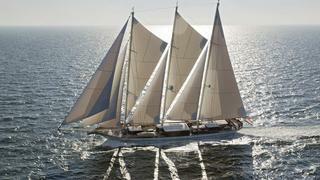 Delivered in August 2010, Marie is the sistership to the triple award-winning sailing yacht Adèle. Both yachts have similar hulls but are easily recognisable thanks to their respective paintjobs: Adèle is fully painted in white while Marie is painted in black. The interior of Marie is customized with a design by David Easton. 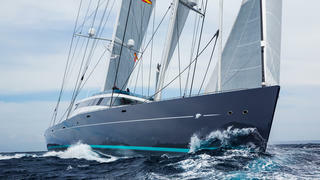 Adèle is an exquisite 55 metre vessel designed by Andre Hoek and currently the 36th largest sailing yacht in the world. Her profile, deck layout and interior design are those of a classic ketch, but her all-aluminium construction, her carbon fibre masts and booms, modern rigging and sleek underbody assure superior performance. Adèle has two guest staterooms forward of the lower saloon and dining area, as well as two aft. Nearer the stern is the master suite, laid out in an innovative arrangement that wraps around the base of the mizzen mast. The suite has a small library with settee and table, and a centerline companionway leads aft to a private cockpit. Royal Huisman carried out a winter refit on Adèle in 2016, which included a systems overhaul, new teak decking and a fresh coast of paint on her bright red hull. Designed by Marcelo Penna, Lamima‘s construction began in early 2012 at the centuries-old boatbuilding village of Ara, Sulawesi, where tourists flock to see traditional methods still in use. In 2014, the sailing yacht hull left Indonesia and headed to Thailand where the Italthai Marine Shipyard finished the build, including the bright and elegant interior décor and the rigging, which was supervised by top rigging experts. There are seven large cabins, all with en suite bathrooms, accommodating 14 guests. There is also accommodation for 20 crew. The boat has been built using traditional ironwood mixed with light bleached oak panels, giving a modern finish “with an Indonesian flair”. Designed by Perini Navi's in-house architects in collaboration with Ron Holland, Fidelis is entirely built in aluminium, including her two masts, the main one being 58.37 metre. 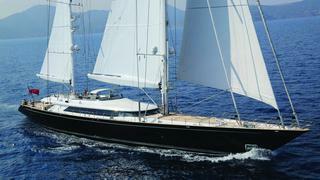 The contemporary interior is also styled by Perini Navi. It accommodates 12 guests in a full-beam master suite and four double guest cabins plus two Pullman berths. 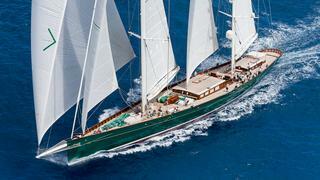 Rosehearty is Perini Navi's third 56 metre ketch to be launched. Built in aluminium, her high performance hull lines have been optimized with consultation from naval architect Ron Holland. Her stunning interior was designed by famous French designer Christian Liaigre and combines classical maritime tradition with contemporary elegance. 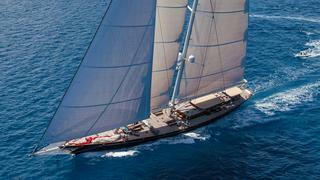 Panthalassa is the eighth sailing yacht in Perini Navi's 56 metre series. 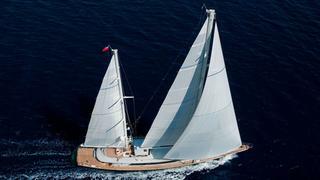 She was designed by Perini Navi’s in-house naval architects together with Ron Holland. With an innovative interior design by Foster and Partners, Panthalassa presents another example of the diverse capabilities of the Perini shipyard. Foster and Partners' approach has been to create light, simple, open interior areas, maximising the interior space of this 56 metre design. Perini Navi Chief Designer, Franco Romani developed the superstructure lines to create a stylish, aerodynamic, low profile, giving Panthalassa a fresh new look in comparison with the previous yachts in this series. 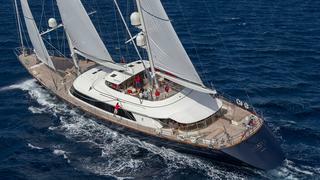 Melek was the 50th yacht to be launched by Perini Navi. Built in aluminium, this huge sailing superyacht is the 9th hull of the 56 metre series, which started in 2003 with Burrasca. Melek, designed by Perini Navi in collaboration with Ron Holland, is ketch-rigged with aluminium masts supporting 1500 square metres of sail. The in-house designers were also responsible for the interior styling. Zenji is a 56 metre ketch rigged sailing yacht built by Perini Navi and is immediately recognisable with her sleek, navy blue aluminium hull. 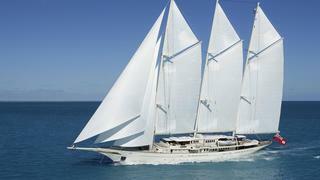 Previously called Santa Maria, she was owned by Oracle’s Larry Ellison and accommodates 12 guests and eight crew. This superyacht boasts Perini’s trademark features of fully battened main and mizzen masts as well as in-boom furling and reefing. 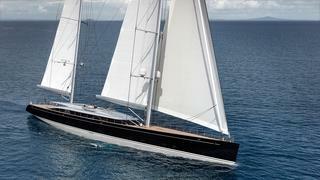 _Silvana _is the sixth 56 metre sailing yacht launched by Perini Navi. She boasts an ultra-light, streamlined aluminium hull with maximum displacement optimised at 540 tonnes in order to guarantee both high sailing performance and extreme comfort. Both masts, the 58.8 metre main mast and the 48.26 metre mizzen, are also aluminium, while the furling main boom is carbon fibre. The interiors, designed by the Perini Navi team, are based on an unobtrusive, classical elegance. Burrasca is at the large end of the highly successful range of Perini Navi/ Ron Holland Design collaborations from 43 to 56 metres. No less than 11 individually-customised versions of this 56 metre ketch design have now been sold as a result of proven sailing performance and handling; beautifully appointed, luxurious yet flexible accommodation; and a solidly reliable engineering and systems platform. 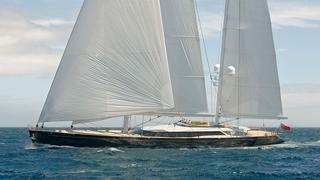 Bayesian (ex-Salute) is the 5th in Perini Navi's series of 56 metre sailing yachts and the first to be designed as a sloop. 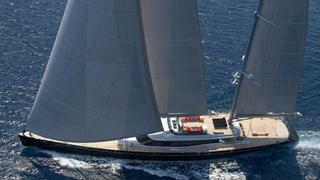 Her 75 metre aluminium mast supports almost 3000 square metres of total sail area. To compensate for the mast’s extra height and weight, the internal ballast was moved forward and length added to the swing keel, which, at full extension, gives Bayesian an exceptionally deep draft of 9.83 metres. The draft and low center of gravity make the yacht incredibly fast and stable at sea. 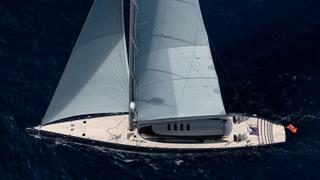 Asahi (ex-Riela) is the seventh 56 metre sailing yacht launched by Perini Navi. She boasts an aluminium hull and both masts, the 58.8 metre main mast and the 48.26 metre mizzen, are also aluminium, while the furling main boom is carbon fibre. The interiors, designed by Rémi Tessier, are based on luxury and elegance combined with contemporary style, which is reflected in the use of a wide and rich variety of precious and refined materials; woods such as macassar, ebony, wengè, teak and leather. 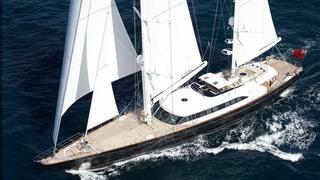 Selene (ex-Parsifal IV) is the fourth yacht in Perini Navi's successful 56 metre sailing yacht series, designed in collaboration with naval architect Ron Holland. Her hull and superstructure have been built from aluminium to optimise displacement. She features a very elegant innovation in her transom, which hydraulically opens to reveal a structural staircase ending with a wide swimming platform for guest access to the sea. Her modern art deco-inspired interior won the best sailing yacht interior award at the 2008 World Superyacht Awards. Built by Astilleros de Mallorca to an Arthur Holgate design, this three masted schooner was originally rigged with square sails on her foremast and was significantly shorter than she is today. Christened Jessica by her original Argentine owner, she was subsequently bought by Alan Bond, winner of the America's Cup in 1983, who renamed her XXXX after his brewery in Australia. Sold again in 1990 to a Spanish banker, Adix was gutted and refitted in England under the direction of Paul Goss, her Tasmanian captain, and Dykstra Naval Architects. This included cutting the hull in half and adding a section, creating a different underwater configuration and lengthening her spas. Delivered in early 2018, Aquarius is hull number 399 for Dutch yard Royal Huisman, who refer to her as the "classic ketch". 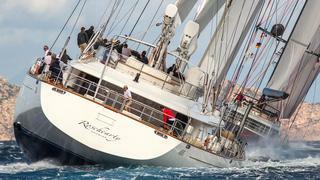 Her American owners commissioned her with both regatta racing and family cruising in mind. The two Rondal masts fall within the Panamax height restriction of 57.91 metres, while her packed garage includes Laser sailing dinghies, kayaks, bicycles, windsurfers and a 6.2 metre jet-drive tender. Measuring 62 metres overall (including bowsprit) and designed by Andre Hoek, Athos has a phenomenal rig and currently the 23rd largest sailing yacht in the world. At 62 metres, the main mast is the longest built by Rondal and, like the 15 metre fore boom and 23.5 metre main boom, is made of carbon fibre. Athos sleeps 10 guests in an owner’s cabin and four guest cabins. 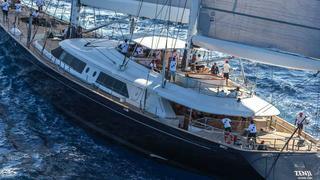 Mondango 3 was built by Alloy Yachts as the successor to the 52 metre Mondango 2. She also features the same design team, with Dubois Naval Architects responsible for the exterior styling and Reymond Langton for the innovative interior design. She can accommodate up to 11 guests in five cabins and also has space for 10 crew. Mondango 3 has a Southern Spars carbon fibre mast and sails from North Sails. Under sail she can easily exceed 16 knots. She also has an impressive range of 6,500 nautical miles under engine. Atlantic is a replica of the famous schooner built for Wilson Marshal, and helmed by Charly Barr. The original yacht was launched in 1903 and her record of the Atlantic crossing in 1905 (The Kaiser’s Cup) remained in place for many years. The new Atlantic is based on the original design of William Gardner. She was launched in March 2008, and then underwent a lengthy and extensive fitting out programme. Her three 50 metre masts were assembled in late 2009, and support 1700 square metres of sail. Built for a hugely experienced owners who were central to the project, Twizzle is laid out with a raised pilot house and fly bridge and is powered by some 1,780 square metres of sail, set on two carbon fibre masts. 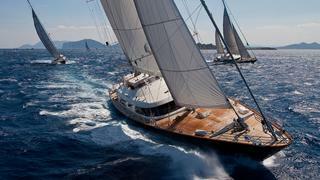 At 57.49 metres long, she's one of the largest sailing superyachts in the world. The main mast is 62 metres, which enables her to pass beneath the Panama Canal’s Bridge of the Americas, endows her with the title of ‘Panamax’ and identifies her as a true ‘go-anywhere’ world-roaming yacht. Below the waterline of this 499 gross tonne beauty is a 3.8 metre draught keel which houses a centreboard that will enhance her windward performance, while 120 tonnes of internal ballast aid stability. The final design from the late Ed Dubois, Ngoni splashed down at Royal Huisman’s Zaandam facility in March 2017. Her codename at the Dutch yard was The Beast due to her owner’s brief for a yacht that was exhilarating to sail, not a wolf in sheep's clothing. Named after an east African indigenous group and their native language, Ngoni boasts an interior by Rick Baker and Paul Morgan that is illuminated by extensive use of glass in the coachroof, including curved wrap-around glazing in the saloon by Turkish contractor BCM. Ethereal is probably the most energy-efficient and eco-friendly yacht afloat. She is owned by Bill Joy, co-founder of Sun Microsystems. His brief to her designer, Ron Holland, included using new technologies and research in fields such as bioengineering. At the heart of her many innovations is a hybrid electro-mechanical propulsion system that can re-charge her lithium-phosphate battery bank whilst under sail, rather than relying on generators. The energy stored in these batteries is sufficient to allow Ethereal to operate silently in "stealth mode", raise anchor, hoist her sails and run the ship's systems for extended periods. The 58 metre ketch Taouey was the largest Perini Navi at the time of her launch in 1994 and remained the queen of the fleet until the launch of Felicita West (now Spirit of the C's) in 2003. She was refitted in 2006 and now sports a white hull. At 58.4 metres, Kokomo is the second largest sailing yacht to be built by Alloy Yachts or, indeed, any other New Zealand yard. She also has the tallest mast ever made by Southern Spars and the largest set of sails from Doyle Sailmakers. The third Alloy yacht under the same name to be built for this owner, she was designed by Dubois Naval Architects with an interior by Redman Whiteley Dixon and her black hull and white superstructure create dramatic lines for this fast cruising sloop. Creole was built for the American businessman Alexander Smith Cochran in 1927. 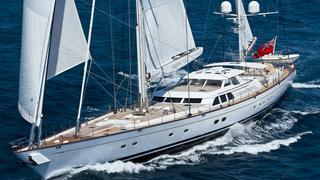 Launched as Vira she was the largest yacht Camper & Nicholsons had ever constructed. Her Bermudan schooner rig was used so that the yacht could be sailed with limited crew who would not have heavy gaffs to pull up. She was used by the Royal Navy during the Second World War, and then returned to her intended use when Stavros Niarchos bought her in 1948. She was rebuilt in 1958, and then purchased by Maurizio Gucci in 1983, who had her restored back at Camper & Nicholsons between 1984 and 1986. She became his pride and joy, later to be accompanied by Avel, another, smaller, Nicholson design. She is a regular on the Mediterranean regatta scene, based in Palma over the winter and used by the Gucci sisters during the summer months. Dykstra Naval Architects were part of an international team of experts that came together to make this special project a success. 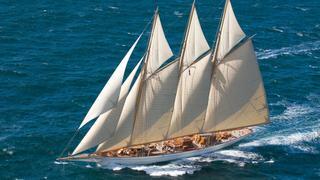 Hetairos's design features a plumb bow, long bowsprit, a traditional sheer line and long overhang. A lot of attention has been given to the styling and design of the classic deck joinery, fabricated with the latest low weight and high tech materials. Similarly, for her interior, Rhoades Young Design undertook extensive research in order to design a ‘ground breaking’ light-weight interior. Launched in May 2013, Seahawk made her world premiere at the 2013 Monaco Yacht Show. With a focus on performance-enhancing technology and sleek lines, the 60 metre line ushers in a new generation of Perini Navi yachts. 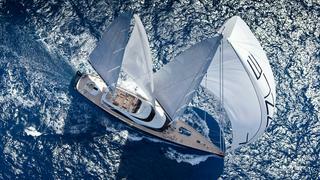 The all-aluminium, ketch-rigged Seahawk features collaboration between Perini Navi’s in-house team and Ron Holland. She boasts a gross tonnage of less than 500 GRT and a displacement of 570 tons. 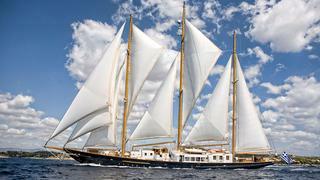 Seahawk has two aluminium masts at 62 and 52 metres, and her sail plan totals 2,125 square metres. French designer Christian Liaigre is responsible for Seahawk‘s elegant yet traditionally maritime-inspired interiors. The focus of her layout is centered around the the staircase, which unites the three levels of the yacht. Seahawk accommodates owner and guests in four en suite guest staterooms and a full-beam owner’s suite that has two beds on either side and can be divided by a sliding wall to convert into two VIP staterooms for chartering. Launched in June 2015, Perseus 3 is hull 56 in Perini Navi’s large sailing fleet, and she is the second hull to be launched in its new 60 metre series after Seahawk. With a carbon fibre mast measuring 75.8 metres, Perseus 3 has one of the tallest carbon fibre rigs in the world. She can accommodate 12 guests in five cabins, including a full beam owner’s suite, which can be divided by a removable wall. She also carries two 6.2 metre custom tenders. Launched in August 2017 as the follow-up to Seahawk and Perseus 3, Seven is a ketch-rigged Perini Navi sailing yacht with naval architecture by Ron Holland. Her 500GT interior by Studio Dante O Benini was revealed at the Monaco Yacht Show 2017. Accommodation is for up to ten guests split across five cabins and her crew quarters allow for a staff of nine people. She is notable for her intricate lighting plan, which was honoured at the 2018 Boat International Design and Innovation Awards. Spirit of the C's (ex-Felicita West) is the third largest sailing yacht so far delivered by Perini Navi (after Maltese Falcon and Sybaris). This elegant Ron Holland design performs exceptionally well under sail, being able to achieve speeds of over 17 knots in optimum conditions. At the same time, her ultra-wide beam of 12.7 metres allows large internal volume as well as side decks on which two people can walk side by side. Her flybridge is able to accommodate all 12 guests at once, while her bathing platform descends from the main deck to provide easy access to the water. The most spectacular views are from the crow’s nest ‘lift’ that ascends 40 metres up the mast. The owner’s suite on the lower deck occupies the entire width of the hull and includes a small lounge, office, wardrobe, bedroom, large bathroom and separate toilet. Also on the lower deck, a further four en suite guest cabins are positioned towards the bow. Mikhail S. Voronstov is the largest wooden schooner in the world. Built in laminated mahogany on steel frames by Turkish yard Dream Ship Victory to a design by Dykstra Naval Architects and Valeriy G Stepanenko, she is RINA classed and was delivered in 2013, going on to collect a coveted Neptune trophy at the 2014 World Superyacht Awards. 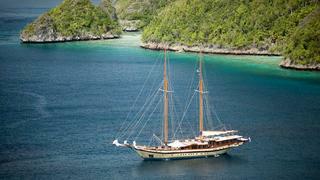 Her Ken Freivokh interiors can can accomodate up to 12 guests in five well-appointeed cabins, with a crew of 10. She is currently listed for sale with Ocean Independence. Formula One racing legend Nelson Piquet’s yacht Pilar Rossi was initially built in Turkey as a relatively modest 33 metre Alucraft motor yacht, but his uncle is Brazilian naval architect Mauricio Piquet, and together they drew up a design to convert her into a sailing trimaran by adding outriggers and two masts of equal height made by Formula Yacht Spars in Lymington, England. An extra 25m of length was added in a Brazilian shipyard. Her interior, decorated by Vivianne Piquet, accommodates 18 guests. She has crossed the Atlantic to the Mediterranean and returned to the Caribbean, but no details of her sailing ability are available. 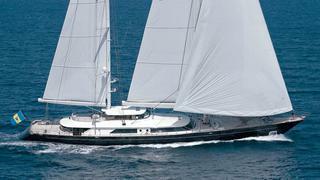 The 66 metre Anatta was the largest Vitters to date when she was launched in 2011. She has a huge composite rudder from Green Marine, giving her great steering and manoeuvrability. Her advanced sloop rig is one of the tallest in the world. 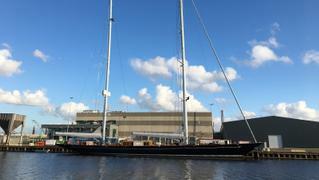 The 83 metre carbon fibre mast was built by Southern Spars and delivered to the Netherlands in two pieces. The main sail can be hoisted in less than two minutes and it only takes 30 seconds to tack the yacht. 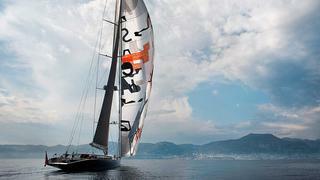 Anatta features unique, customised sail art designed by Norwegian artist Magne Furuholmen. The artwork on the Code 1 sail is the world's largest artwork on canvas. 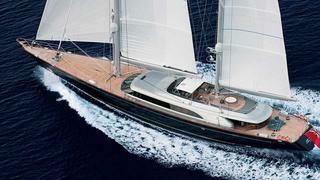 The 67 metre Vertigo is the largest sailing yacht built in the Southern Hemisphere to date. She was commissioned by a first-time owner looking for extended cruising capability. Vertigo is also one of the largest superyachts in the world. Vertigo's Christian Liaigre designed, loft-style interior features an ‘urban at sea’ ambience. Sleek surfaces and a natural palette of black and white leather and tan linen furniture reinforce the design theme. She boasts a 10 person Jacuzzi with retractable sun pads, as well as glass screens to offer protection from the wind. She has a midship hull opening for storing four tenders and a host of toys. There is accommodation for 12 guests, as well as a classroom and office. 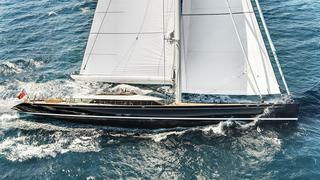 Vertigo was named sailing superyacht of the year during the 2012 World Superyacht Awards. The second largest Perini Navi sailing yacht to date, Sybaris was built for the multiple superyacht owner Bill Duker and launched in 2016. The name comes from a Greek settlement in ancient Italy that was famed for its hedonism, feasts and excesses. Featuring naval architecture and sailplan optimisation by Philippe Briand, this all-aluminium ketch can host up to 12 guests across six cabins. Interiors are by PH Design with a total internal volume of 870GT, while the crew quarters allow for a staff of up to 11. Under power, Sybaris’s twin MTU 16V 2000 M72 diesel engines generate a total of 3,860hp, resulting in a top speed of 17.5 knots and a maximum cruising range of 5,000 nautical miles at 12.5 knots. 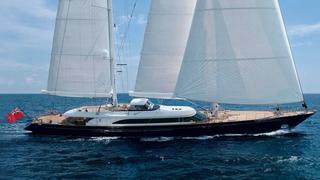 The 75.12 metre Enigma was built in 1976 for single-handed yachtsman Alain Colas as Club Mediterranée. 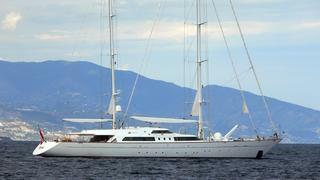 In 1986 it was converted into a cruising yacht for French entrepreneur Bernard Taipei. She was then sold to Mouna Ayoub in 1999 and modernised at Lürssen. The refit included interior and exterior enhancements by British naval architect Butch Dalrymple-Smith. 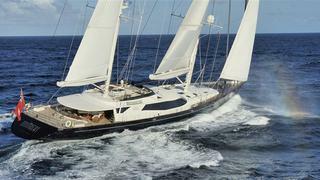 The yacht has accommodation for 12 and has reached a top speed of almost 20 knots under sail. 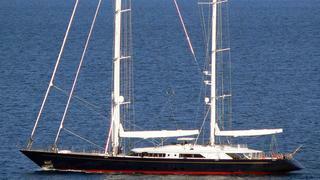 She is currently available for charter and is the eighth largest sailing yacht in the world. Built by Vosper Thorneycroft in Southampton, England, M5 was launched as the iconic yacht Mirabella V in 2004. She remains the world’s largest sloop to date. She was designed by Ron Holland for American yachtsman Joe Vittoria, who enjoyed sailing her for seven years before she was sold on. 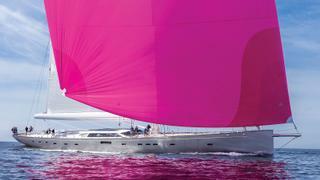 The new owner renamed her M5 and she was extended by 3.2 metres in a refit at Pendennis before her relaunch in 2013. She also has a new interior designed by Redman Whiteley Dixon. M5 has a displacement of 780 tonnes (165 tonnes of which is the keel). Her carbon fibre mast is an amazing 88.3 metres tall and can carry approximately 3,700 square metres of sail. 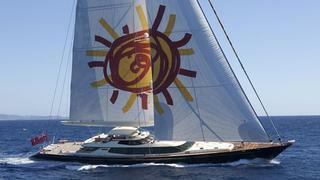 Athena was built by the Royal Huisman Shipyard in Holland for US software developer Jim Clark. 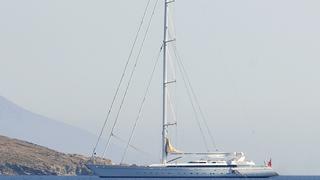 Her advanced engineering means that the iconic Athena is able to sail in relatively light airs, while still offering the interior space normally only found on motor yachts. 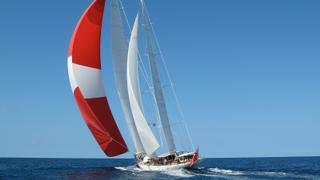 In stronger wind she has been credited as attaining 19 knots under sail. Her three closed deck include a large owner's suite, four guest suites, a saloon and dining room on the main deck and a sky lounge on the upper deck. EOS was built in Germany under a cloak of secrecy for her American media and movie mogul Barry Diller. 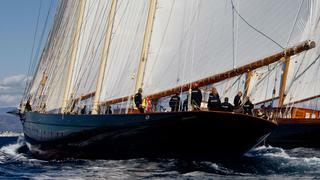 She is a three-masted Bermuda rigged schooner and was refitted at Royal Huisman in 2011. After emerging from her refit she caught fire in Norway and had to return to the yard to be repaired. 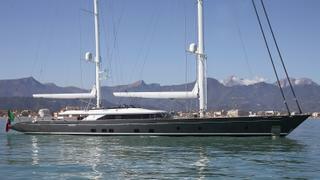 The highly anticipated Aquijo was the result of a collaboration between Vitters and Oceanco. Both Dutch yards worked closely with the owner's representative to create a highly complex, performance-driven sailing machine that became the third largest sailing superyacht when launched. 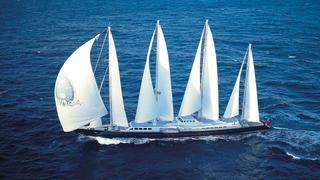 She is an aluminium ketch-rigged yacht, and features a custom steering system. Aquijo's interior layout provides clear sight lines thanks to her high-volume superstructure. 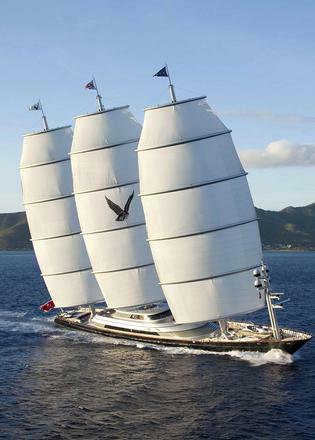 Maltese Falcon was built for the late American venture capitalist Tom Perkins, and is now owned by Elena Ambrosiadou. 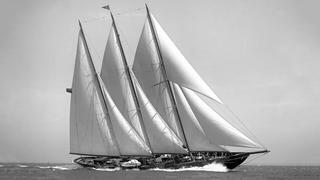 The iconic three-masted schooner is the third largest sailing yacht in the world. Her rig is made up of three unstayed, 'weapons-grade' carbon fibre masts, with a fully computerised sail and rotating mast system. The system has been dubbed a triumph of design, development and engineering and Maltese Falcon has topped an impressive 24 knots under sail. The Ken Freivokh interior is a marriage of industrial chic and high tech. It features leather, glass, wood and steel as well as a modern art collection. 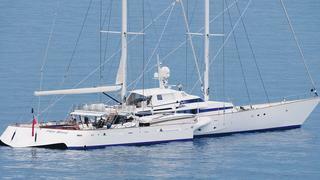 She has accommodation for 12 guests and is available for charter. Sea Cloud was designed by Cox & Stevens and built as Hassar II by Friedrich Krupp in Kiel, Germany for Edward F Hutton and heiress Marjorie Merriweather Post. Following their divorce Marjorie kept the yacht and renamed her Sea Cloud. Then, after serving during World War II, she was owned by the Dominican Republic dictator Rafael Trujillo, who renamed her Angelita, then by Clifford Barbour, who renamed her Antarna. She was rebuilt in 1978 by new German owners, who changed her name back to Sea Cloud. 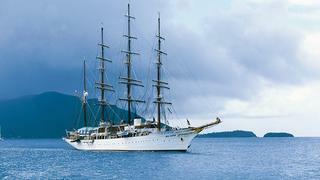 She has 60 crewmembers and 32 guest cabins and is now available for luxury charter all year round. 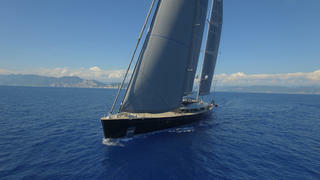 Instantly recognisable with her black sails and Dynarig set-up, Black Pearl is the largest sailing yacht in the world. Delivered during the same year as 142.81 metre Sailing Yacht A (officially designated as a sail-assisted motor yacht), she spent five years in development at dutch yard Oceanco. Dykstra Naval Architects, Ken Freivokh, Nuvolari Lenard, BMT Nigel Gee and Gerard P Villate all contributed their expertise to this monumental project, which looks set to turn heads the world over for decades to come.